The Committee on Capital Markets Regulation today released data on the total public financial penalties imposed on financial institutions in the United States in 2013. Public financial penalties include public class action settlements that arise from class action lawsuits brought by the government (e.g., state attorneys-general) and regulatory penalties that follow enforcement actions by regulatory agencies including the SEC, CFTC, and others. 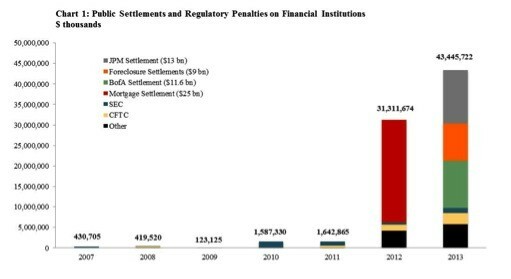 In 2013, total public financial penalties reached approximately $43.4 billion, with the fourth quarter alone adding $18.6 billion, in large part due to the settlement reached between the federal government and JPMorgan. The fourth quarter total is not only a marked increase over the penalties imposed in prior quarters, but it also contributed to a record high annual amount of financial penalties in 2013. The data show that 2013 has continued a trend of historically unprecedented public financial penalties imposed on financial institutions.